You are alone in your cabin, about to eat the dinner you've just cooked. You take a bite—but the meal is cold. You return it to the oven, but that's cold, too. You check the clock, and then, in rising panic, the telephone operator. The answer is the same: somehow, two days have disappeared, and you have no idea where they went. Your only clue: on your leg, a new, blood-red scar. The Lady From Heaven follows three individuals as they come to grips with their unwilling participation in the world-wide abduction phenomenon: A CIA analyst who’d rather be indoors, a young South American boy who believes he’s met the Virgin Mary, and the suicidal son of a Texas rancher. Although their stories seem like science fiction, The Lady From Heaven is based on true experiences shared by tens of thousands of Americans—including the author—and untold millions of others world-wide. Paul S. Cilwa is himself an abductee. When not communing with non-humans, he has been a computer programmer, trainer, and the author of four books on Windows programming as well as two other novels. He lives in Phoenix, Arizona. 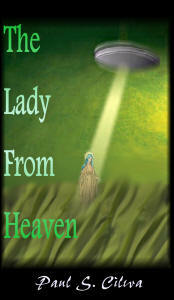 Given my interest in UFOs, it was inevitable that I would write The Lady From Heaven, an adventure novel that examines the controversy regarding UFO abductions from the points of view of three ordinary people: a CIA information analyst, a South American boy, and the son of a Texas rancher. I spent three years researching, not only UFO abductions, but the places in which the story takes place so that I could write about them convincingly: The Washington, DC, suburbs; Mount Shasta in California, and the deep rain forest of El Oriente, Ecuador's back country.